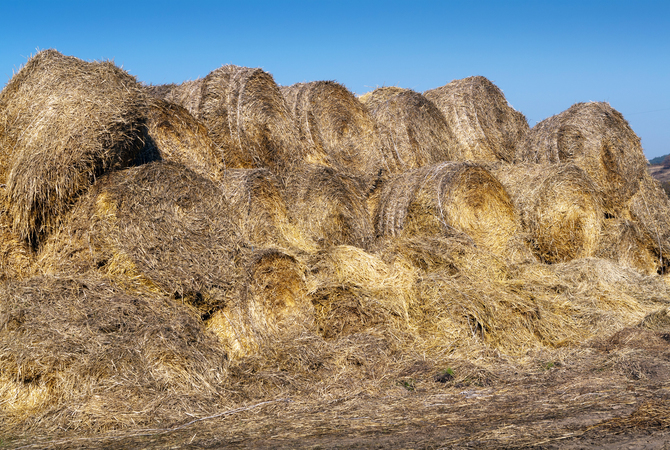 Allergens in dust and mold in deteriorating hay - A cause of horse respiratory disease. Research shows that many diseases in horses have a nutritional component. While some diseases may be caused by improper feeding or inadequate nutrition, others, not directly related to nutrition, can be helped greatly when the horse's need for certain nutrients is met. Any disease that causes damage to the intestinal wall increases the need for specific nutrients for tissue repair. Nutrition affects your horse's health in many ways. Any disease that causes a reduced appetite or overall decrease in feed intake increases the need for a higher percentage of the proper nutrients to ensure that the horse's daily nutritional needs are met. Anemia is an example of a condition that results in a reduced appetite and reduced feed intake, yet responds to treatment when increased minerals, proteins andB vitamins are added to the diet. Diseases that are directly related to the metabolism of certain nutrients may be inherited or common in certain breeds. Azoturia is an example that affects draft horse breeds that perform hard work during the week, are rested on the weekend without a decrease in their grain allotment, and then cramp up when back on the job on Monday morning. Any disease that causes damage to the intestinal wall increases the need for specific nutrients for tissue repair. Colic due to gastroduodena ulcers and enteritis are examples of a disease or condition that puts the horse's digestive system at risk and requires special nutrients both to cure and repair the damage. Diarrhea which is involved in many diseases and conditions in horses decreases the absorption of nutrients, especially electrolytes and protein and increases the need for additional intake of these nutrients. Anemia: The diagnosis of equine anemia is based on clinical signs that reduced oxygen is being transported to tissues and that a reduced packed cell volume of red blood cells is circulating in the bloodstream. Although a number of causes of anemia such as parasite, internal bleeding, viruses, cancer, and ulcers exist, anemia may also be caused by deficiencies in iron, copper, protein and B vitamins. These deficiencies impair the body's ability to manufacture red blood cells. Adding or increasing the amount of these nutrients in the horse's diet may be as simple as adding oats or oat oil to the diet. Research has shown that oats have a beneficial effect on the digestive system which can stop bleeding and cure cases of anemia where a lack of nutrients is involved. Azoturia/Tying Up: Several factors are involved in the occurrence of azoturia, which is also known as tying up or rhabdomyolosis, including breed, work schedule, feed, and body condition of the horse. This condition involves the breakdown of striated muscles after exercise. Over-feeding a horse a diet that is too rich in protein is nearly always a major factor in attacks of azoturia. The problem starts when the horse's body accumulates too much glycogen or lactic acid as a result of carbohydrate metabolism within the skeletal muscles when being overworked. When the glycogen or lactic acid becomes too concentrated, the horse loses strength and the muscles begin to degenerate. As a result, large muscle groups tend to seize up and remain in a state of contraction. A diet that is reduced in carbohydrates and includes plenty of good quality hay and water helps to reduce incidents of tying up. In addition to lowering the amount of carbohydrates in the diet, making sure that the horse's electrolytes, especially potassium, sodium, magnesium and calcium are kept at optimal levels has proven to be helpful in preventing azoturia. Colic: Colic is defined as any abdominal pain and usually involves the gastro-intestinal tract. High grain-based diets that are low in forage are often seen as a cause of some kinds of colic. In addition, tainted or moldy feed can cause colic. Too much early spring grass can also lead to bouts of colic when horses are turned loose and allowed to ingest too much at one time. A horses digestive tract is unforgiving to a poor or frequently changing diet. When large amounts of grain or green grass are ingested in a single meal, it can lead to distension of the horse's relatively small stomach. In severe cases, it can cause the stomach to rupture which is fatal. When feeding grain, you may want to mix chaff through the feed to slow down the intake. In addition, give the grain in several small feedings as opposed to one large feeding. One of the best preventative measures for colic is the feeding of plenty of good quality hay on a regular basis with several meals a day. The horse's digestive system works best when it is constantly working to digest fibrous feeds such as hay. Cystitis: Equine cystitis usually occurs in horses pastured on sudangrass, sorghum or sorghum-sudan hybrid. Symptoms include loss of hair, muscular incoordination and staggering. Damage may be temporary or permanent and may result in death. Although equine cystitis does not affect all horses that are pastured on these grasses, it is best not to allow any horse to feed on the named grasses, although it is safe to feed hay of these species to horses. Developmental Orthopedic Diseases (DOD): Developmental orthopedic diseases come in many forms and have multiple causes. DOD includes diseases of the bone, joints and growth plates in the growing foal. When a foal is seen to have DOD, the feeding program is often the first place for evaluation. An imbalanced ration with too much energy, inadequate protein, mineral deficiencies or imbalances are often the triggering factor in DOD. Balanced energy: Does the energy meet or exceed the horse's requirements based on NRC standards? Protein: Is the protein balanced for the energy being fed and is the protein source adequate in the amino acid lysine? Calcium and phosphorus: Is adequate calcium and phosphorus included in the diet and is the calcium:phosphorus ratio correct for the growing horse? Are adequate copper and zinc included in the diet and is there any environmental source of zinc that could cause a zinc excess? Forage and fiber: Is forage offered to the young horse in adequate quantities in a form that the horse can readily eat? If concentrates are included in the diet, do they compliment the kind of forage being fed? Enterolithiasis: Enteroliths are large stones that form in the intestines of the horse. Comprised of mineral salts that form around a small object such as a stone, a wood chip, a piece of metal or string, they may cause intermittent bouts of diarrhea, colic, and a depressed demeanor if they are small. This condition is known as enterolithiasis. If the enterolith becomes large enough to become lodged in the small colon, the horse will show signs of severe colic. Enteroliths may also become lodged in the pelvic flexure or the junction of the large and small colon. If not caught and treated, rupture of the intestine may occur which is fatal. Diets high in alfalfa hay are seen as a risk factor and are higher in some locations such as California, Florida and Louisiana possibly because mineral content of the feed as it relates to the soil in these areas. Horses with enteroliths have a higher pH in the large colon as well as a higher mineral content. Removing alfalfa feed and bran from the horse's diet and avoiding too much confinement in stalls will sometimes, if not always, prevent the development of enteroliths. In addition, horses should be allowed more grazing time and be bedded on straw as opposed to wood shavings which, if ingested, could trigger the start of a stone. Some veterinarians recommend that a horse should be fed a cup of apple cider vinegar twice daily, especially if the horse continues to be fed alfalfa hay. The vinegar may decrease the pH in the hind gut. Small enteroliths will be passed in the manure, but surgery is necessary to remove larger ones. 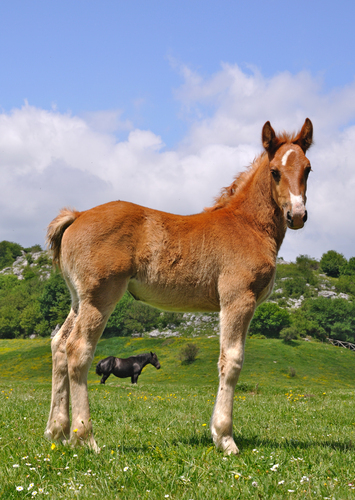 Epiphysitis: Epiphysitis is defined as structural changes in the physis, which is the growth plate of a bone, caused by excessive pressure either from too much weight or concussive force on the undeveloped skeletal structure of a foal, weanling or yearling. Weight and bone growth must be kept in balance to avoid epiphystitis. When the young horse gains too much weight too rapidly because of the richness of the mare's milk or the ingestion of too much high-caloric feed, the bone growth does not keep up with the weight gain and problems develop. The best course of action is to reduce the nutritional intake of the young horse. If the foal is still nursing, reduce the concentrate fed to the mare. If the horse is a weanling or yearling, reduce the high caloric or high supplement diet to slow down the weight gain. Fescue Toxicity: Although most horses can eat fescue pasture grass without any problems, pregnant mares should not be allowed to graze in pastures that contain fescue. An endophyte in fescue affects a number of hormones in the mare's system and has the overall effect of decreasing milk production, prolonging pregnancy and/or causing a thickened placenta that may result in a difficult birth, an abortion or a stillborn foal. Heaves (COPD): Dust and molds found in hay can aggravate horses that have chronic obstructive pulmonary disease which is similar to asthma in humans. These allergens when inhaled into the respiratory tract cause further damage and can seriously affect the health of the horse. Laminitis: Laminitis also known as founder is a vascular disease associated with the laminae which secure the coffin bone to the hoof wall. Inflammation interferes with the bond between the bone and the wall, and in advanced laminitis, the coffin bone becomes detached from the wall and may rotate or sink causing pain and lameness. Avoid feeding excesses and keep the horse at a reasonable weight. Watch for and avoid grass blooms on pastures. 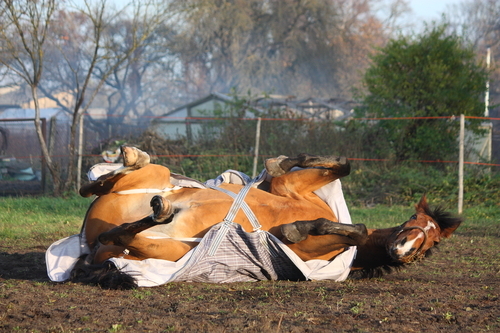 Pull the horse off the pasture and put in a dry lot if necessary. Feed hay in the morning and turn the horse out after the dew has evaporated from the grass. Keep grain in closed bins and the door to the feed room secured to prevent a horse from gaining entry and gorging on grain or feed. Give the horse unlimited access to fresh clean water except immediately after strenuous exercise when the amount should be regulated. Make changes in diet and routines slowly and progressively and give the horse time to adapt. Other health problems and diseases related to nutrition include diseases that are responsive to vitamin E supplementation such as equine degenerative myeloencephalophty, and white muscle disease, and some types of hoof problems that react well to supplemental biotin and methionine. This article does not begin to cover all of the diseases and conditions related to nutrition, but with some research and by contacting your veterinarian or county extension office with specific questions in mind, you will be able to gather the information necessary to promote the health of your horse.